Boating HD : Get The World’s Best Boating App in its FREE version! Tracks, Routes, Distance, Markers, Wind Forecasts, Sync my Data, Photos and Sharing are available for free! US Govt. Charts are also included. Then download charts from Menu>Charts & Upgrades. You will get the same award-winning detailed charts as GPS plotters! Provided in a fully-comprehensive, all-in-one Navionics+ package! Try it for free before you purchase. Note: all Navionics Boating apps have the same features. The difference between Navionics Boating free version and the other titles is that the free version allows you to experience the app’s functionality before you make the decision to purchase charts. IMPORTANT: This application is optimized to run on tablets and will not run on handset devices. Navionics charts are available In-App from Menu> Charts & Upgrades (see below). Once purchased, they are downloaded to the device and stored for easy access whether or not your device is connected to internet! Record and view your tracks: Create and edit routes based on cruising speed and fuel consumption. Measure distance. Add markers to selected locations. Check wind predictions anytime and sun/moon cycles. Overlay: Google Maps, Bing or Terrain. Select Safety Depth and switch to Easy View. Not available on Govt. Charts. Automatically sync your Tracks, Routes & Markers and Photos among all your mobile devices. Geotagged photos appear on the map. Email, Tweet or FB your routes, tracks, photos or markers! Your friends can learn about your day on the water by viewing the .kmz file you send them! It’s so cool! Download free articles from the world’s leading marine publications. Marine & Lakes government charts for US provide “ready to navigate” maps. √ Tap Menu> Charts & Upgrades to select charts from our global catalog. Charts are offered in the fully-comprehensive, all-in-one Navionics+ package, including Nautical Charts, SonarCharts™, Community Edits, plus 1 year of Chart Updates. SonarCharts™ is an HD bathymetry map featuring extraordinary bottom contour detail great for increasing awareness of shallow waters and for locating fishing areas at any depth level. Community Edits are inputs made by users and shared for all to benefit: rocks, wrecks, obstructions, buoys, beacons, etc. Also use the Search feature to access the largest database of marine POIs or lat/long for Marina, Marine Repair, Boat Dealers, Waterfront restaurants, etc. View dynamic Tides & Currents where ebb/flow and height are shown for tides and direction and speed for currents, then tap for access to forecasts and graphs. Free Trial before purchase! Check coverage at Navionics.com. √Advanced Map Options allows you to Highlight Shallow Areas, select Depth Shading, filter Depth Contours, adjust shorelines to selected Water Level, view Seabed composition (available for select US HD lakes, Portugal, France and North of Corsica) and toggle Fishing Mode to locate key fishing areas. Enjoy a FREE trial after you purchase a chart. IMPORTANT- Navionics has certified the following Android tablets with an OS of 3.0 or higher: NAVIOTAB, Nexus 7, Motorola XOOM MZ604, Asus eeePad Transformer TF101, Samsung Galaxy Tab 10.1′ GT-P7500, Acer Iconia Tab A501. ALL SALES ARE FINAL on Google Play store. Navionics apps are designed to load and operate correctly with all tablets with an Operating System of 3.0 or higher. However, we cannot guarantee flawless operation on non-certified Android devices. Navionics does not support any non-certified Android devices. Please check our App Description or go to Navionics.com for an up to date list of certified devices. 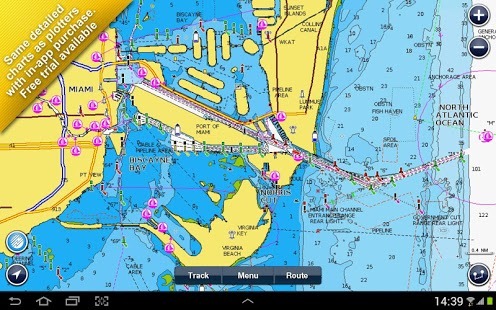 Please refer to Navionics Mobile Android Tablets FAQs section. Rocks drawn with too light line, texts too bold. Maps built for better resolution than in Galaxy Tab 2/7 which makes them hard to read in certain areas and zoom levels. Errors in maps. Signs disappear while zooming. Zoom an pan work fast. Route building is fast and easy. Missing interface devices and possibly drivers for autopilots and (Actisense) sounders. I’d like to record depths under my boat. Should use OSM for land roads. N maps in my yacht with contradictory opinion. Humming bird Navionics MSD/nav+1 purchased for boat, this app is a great complement to that in order to look at courses and structure. Wish the app was free with purchase of the purchase of the SD card., continuing with this rant, we got the card today, thought maybe we could get the mobile version? No, we have to purchase the mobile version and the humming bird version to get both. I’m extremely disappointed that we have to purchase both to get the same product? Lance: We regret to hear of your disappointment. The Mobile and plug & play products contain the same chart data but are completely separate products. App sales are handled directly through the Android, iTunes or Windows Store directly and would require a separate purchase for phone or tablet.